In the penultimate episode of Hotel King, most of the various plotlines from the past 30 episodes are resolved, at last. All those murder mysteries, hidden stacks of money, abandoned sons, and other ridiculousness are front and center in this episode. With many of the lingering questions answered, it makes me a little wary about what the final episode will hold. Knowing this show, they will probably give everyone a happy ending…although I’m not sure how much these characters actually deserve it seeing as how they’re all pretty terrible people. Anyways, we’re finally in the home stretch now, so let’s see how much more awful Ciel Hotel (aka already the worst hotel in the world) can get! Jae-wan just drove up to a stabbed and bleeding Joong-goo on the ground, and sees Roman walking away from him with blood all over his hands. Jae-wan brings out his crazy eyes, and freaks out at Roman for what he’s done. He doesn’t want his younger brother to live the rest of his life as a murderer like he did, so he quickly wipes the blood from Roman’s hands and orders him to leave the crime scene. Roman basically tells Jae-wan that he just did what he couldn’t do, which is protect their mother. Truth. But Jae-wan pulls the, “I’m your big brother, so you have to listen to me,” card and pushes Roman to leave. After checking to see if Joong-goo is still alive, Jae-wan drags him into his car and takes him to the hospital. Uh oh. What did you do, Roman? Joong-goo manages to survive Roman’s stabbing because the knife missed his spleen by an inch or so. When Roman later finds out about this from Jae-wan, he laments that his stabbing skills must have deteriorated. Roman is a skilled stabber? Somehow, I am not that surprised by this revelation. Jae-wan tells Roman that he seriously needs to get back to America ASAP because Joong-goo is not going to let him go, and will definitely come after him. Roman is reluctant to leave his mother with Jae-wan, knowing that Joong-goo is still alive and hanging around, but he finally agrees. Whiskey is not the solution right now. When Joong-goo is discharged from the hospital the next day, Jae-wan is there to pick him up. They have the best hospitals on this show; everyone recovers from deadly wounds super fast! Joong-goo casually drops the fact that he knows Roman is Joo-wan, Jae-wan’s brother, and threatens to reveal his attempted murder if Jae-wan tries to go against him again. Gritting his teeth, Jae-wan agrees to it and basically becomes Joong-goo’s caretaker for the time being. Joong-goo & Jae-wan, together again. Chairwoman Baek and Jae-wan take Roman to the airport to send him back to America. His mother doesn’t know why he’s leaving, but she becomes sad when she sees how sad Roman is. On the other hand, Jae-wan doesn’t look that sad. Roman was totally right; Jae-wan is totally out to steal his mom from him. After they bid Roman farewell and watch him go through the security gates, they leave. But wait! Roman waits til they’re gone before coming back out of the security gates, and leaves the airport. Guess he’s not going to America anymore. When Jae-wan gets back to the hotel, he’s met by the team leaders in the lobby who all excitedly tell him that they just found out that he’s been acquitted from his “inspection.” Seeing as how he was guilty for a good portion of the stuff that he was being “inspected” for, Jae-wan knows that something must have happened for him to get this acquittal. He realizes that Roman must be behind this. Jae-wan calls Roman, and finds out that he’s outside of the police station right now about to turn himself in for the attempted murder of Joong-goo. Noooooo, not Roman! Send Jae-wan to jail! And that’s the last we see of Roman for now, so I guess we can assume that he’s in jail. Right after he gets off the phone with Roman, Jae-wan hears from Joong-goo. Joong-goo is going crazy because he found out that Jae-wan had all of Chairwoman Baek’s hotel shares transferred to Mo-ne. He had this done after he found out that Joong-goo forced his mom to sign over her shares to him. I didn’t realize that hotel shares were so easily transferrable, but okay if you say so, Hotel King. Joong-goo accuses Jae-wan of allowing him to turn Roman in for the attempted murder then, not knowing that Roman already did that himself. Jae-wan smirks upon hearing this, tells Joong-goo that he’s wrong, and hangs up the phone. Joong-goo’s already bad day gets even worse when he finds out that his wife and daughter are planning to leave Korea for England for good. His daughter even changed her last name from Lee to Yoon, in an attempt to sever ties with her father. And when he calls his driver, he receives an automated message that the number has been disconnected. A lightbulb goes off in Joong-goo’s head, and he rushes off to his secret hidden room where he keeps a safe full of gold bars and stacks of money. He finds his safe emptied out, and all that’s left there is a note left by his driver saying that he is taking the money as payment for having to do Joong-goo’s dirty work for the past 10 years. From inside the secret room, he suddenly hears the police inside his house looking for him, so he hides and runs away when he gets the chance. Jae-wan apparently reported Joong-goo to the police for probably the explosion incident at the building. In the meantime, Chairwoman Baek is hanging out at Ciel waiting for Mo-ne to finish with work. She wanders around the hotel looking for the restroom and stumbles into the Board of Directors’ conference room. 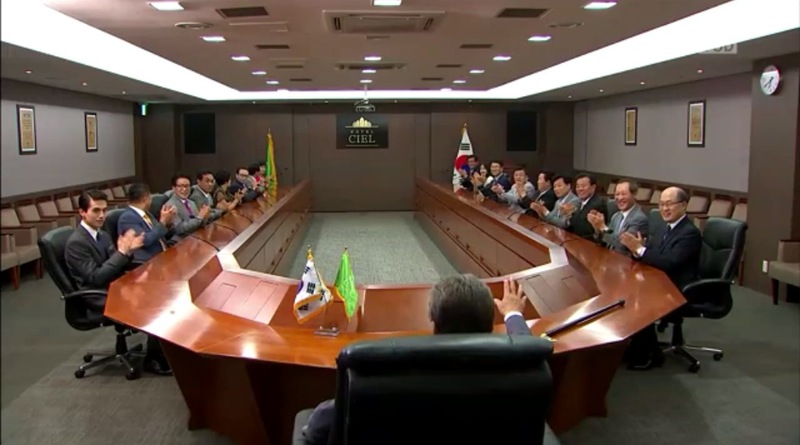 After secretly leaving his house without the police’s knowledge, Joong-goo has gone back to Ciel and to the conference room. There, he finally sits in the Chairman seat, dreaming about the hotel being his and Jae-wan and the other hotel employees congratulating him on rightfully becoming Ciel’s Chairman. When he wakes up from his daydream, he hears a noise and finds Chairwoman Baek hiding underneath the table. FLASHBACK! The night of Chairman Ah’s “suicide,” Chairwoman Baek goes into his office after hearing a commotion from inside. By the time she gets there, it’s already too late and Chairman Ah has fallen to his death. While she’s looking out the window at the scene below (wearing the star necklace, of course), Joong-goo was hiding underneath the desk the whole time. So, the whodunit mystery of Chairman Ah’s death has finally been solved. Joong-goo was the one who pushed him out the window. After finding Chairwoman Baek in the conference room and seeing Ciel surrounded by the police, Joong-goo takes her with him to the hotel’s ski jump. Jae-wan, Mo-ne, Woo-hyun, and the police rush over to the ski jump to save Chairwoman Baek, but Joong-goo is holding her hostage with a knife to her neck. Joong-goo demands that the police leave the premises and allow him to leave without harm, or else he’s going to hurt Chairwoman Baek. The police doesn’t back off, so Joong-goo takes Chairwoman Baek to the top of the ski jump with him. Jae-wan somehow convinces the police to let him talk to Joong-goo alone. He tries to convince Joong-goo to release Chairwoman Baek, but to little avail. Joong-goo reprimands Jae-wan for turning his own father in, and is prepared to die alongside his mother. All of a sudden, Chairwoman Baek attacks Joong-goo by pushing him in his knife wound area, causing him to collapse in pain and releases her. Mo-ne and Woo-hyun show up right on time and takes Chairwoman Baek downstairs to safety with them. Did the police just let everyone go up to the ski jump amidst this hostage situation/stand-off? Joong-goo launches into a speech about how it’s unfair that all this misfortune is happening to him because it was Chairman Ah who truly deserved it. His lifelong hatred for Ah Seung-won was because he always laughed at him for being beneath him in everything, and he stole the hotel and the women he loved (Baek Mi-yeon) from him. He tells Jae-wan that his wife and daughter left him right after they found out he didn’t have money anymore, and that if he didn’t treat Jae-wan so harshly while he was growing up, he would have left him too. Joong-goo climbs onto the ledge of the ski jump, surveying Ciel and what he has strived for his entire life. [Hotel] King of the world. Joong-goo looks back at Jae-wan and tells him that he truly did love him even if Jae-wan didn’t believe it, and jumps off of the ledge. Jae-wan rushes over and is able to grab his hand just in time. Joong-goo is grateful that despite everything Jae-wan is still willing to save his life, and thanks him for the gesture. Jae-wan tries his hardest to hold onto Joong-goo’s hand, but Joong-goo lets go and falls to his death. Holding on for dear life, or not. TIME JUMP! After Joong-goo’s death, Jae-wan and Chairwoman Baek leave Ciel to move into a house by the seaside. Mo-ne is then reinstated as Ciel’s Chairwoman. A year later, the hotel is still without a GM because Mo-ne is keeping the position open for Jae-wan’s return, but that doesn’t look like it’s going to be happening anytime soon. One of Korea’s most famous celebrities, Chae Won, is at the hotel to have her wedding ceremony. She’s arrogant, picky, and annoying. Does she remind you of someone else? Cough, cough Mo-ne. She has a huge list of demands for her wedding, and refuses to let anyone at the hotel plan it besides Jae-wan because he’s the reason she agreed to have the ceremony at Ciel in the first place. Mo-ne makes the long drive out to find Jae-wan to come back to the hotel. When she finally finds him and Chairwoman Baek, they look at each other as if they haven’t seen each other in an entire year…which is exactly what has happened. Chae-kyung leaves Ciel and Haemil to focus on her other businesses because they can’t be entrusted to her late husband’s sons. Before she leaves, however, Mo-ne can’t help but be rude. She tells Chae-kyung that her leaving means that she’s finally won Jae-wan for herself. Yeah, some prize.